This student-friendly, highly visual text expands students’ viewpoints from the client-nurse relationship to a population focus. Acknowledging that population-focused tools and interventions are needed in acute care, as infection rates continue to rise and nurse-sensitive outcome indictors are closely monitored, Cherie Rector weaves in meaningful, real-life examples, case studies, and perspectives to help students understand that transitions in care are critical in today’s healthcare system. Covering a multitude of community and public settings, situations, and populations, the book helps students learn about promoting health, preventing disease (not just treating it), and protecting at-risk populations—including the elderly, the LGBT community, and veterans. This fully updated 9th Edition encourages students to think more globally and covers new innovations and emerging threats to the public’s health. NEW! QSEN sections tie key chapter concepts to quality and safety competencies, such as patient-centered care, teamwork & collaboration, evidence-based practice, quality improvement, and informatics, to help students understand the importance of these concepts. NEW! Application to Population Health explores chapter concepts from a population-focused viewpoint and offers current examples of effective population interventions. What Do YOU Think? encourages students to reflect on thought-provoking current topics or dilemmas, enhancing critical thinking skills. Evidence-based Practice demonstrates how current research examples can be applied to public/community health nursing practice to achieve optimal outcomes. From the Case Files presents case study scenarios with application-based questions, challenging students to reflect on assessment and intervention. 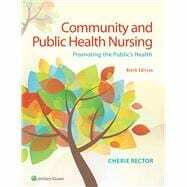 Perspectives from nursing students, novice to expert public health nurses, faculty members, policy makers, and clients cover commonly held misconceptions about community health nursing and link between skills across settings. Healthy People 2020 highlights pertinent goals and objectives to promote health. Activities to Promote Critical Thinking at the end of each chapter challenge students, promote critical-thinking skills, and encourage active involvement in solving community health problems. Unique Levels of Prevention Pyramid boxes address a chapter topic and describe nursing actions at each of the three levels of prevention to help students understand this basic community health nursing concept. Content from the text is embedded into two integrated digital learning solutions—Lippincott CoursePoint for pre-licensure programs and Lippincott RN to BSN Online for post-licensure programs—that feature experiential, case-based instructional design aligned with the approach of the Ninth Edition. To learn more about Lippincott CoursePoint and Lippincott RN to BSN Online and to see our Video Cases, please visit http://nursingeducationsuccess.com.